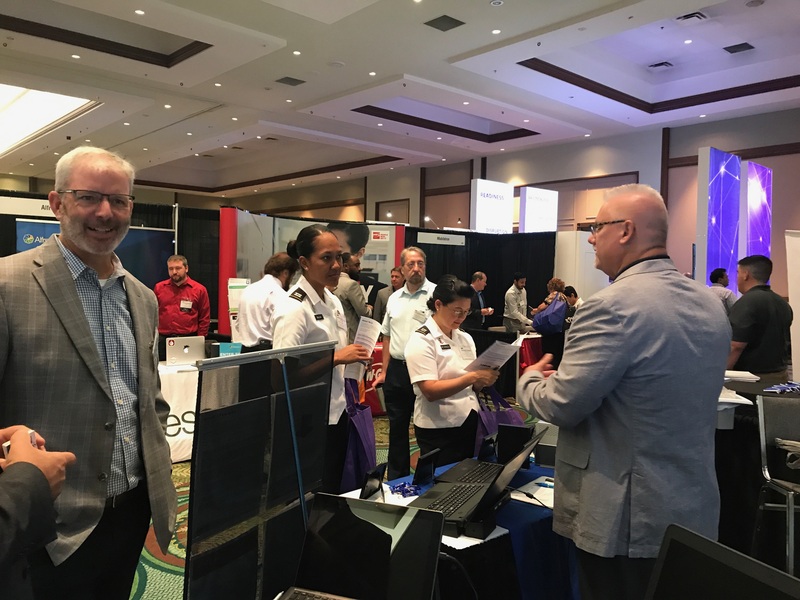 NCS Booth #608 continues to be extremely crowded at Day 2 of Defense Health Information Technology Symposium (DHITS), Caribe Royale Hotel and Convention Center, Orlando. Defense Health Agency (DHA) is a joint integrated Combat Support Agency that enables the Army, Navy, and Air Force medical services to provide a medically ready force and ready medical force to Combatant Commands in both peacetime and wartime. We encourage you to please stop by Booth #608 and talk to Joe Guest, Matt Cooke and Linda Letosky about the many ways NCS can improve patient care, lower costs and ease IT administration. NCS is promoting much of its solutions portfolio, including end-to-end virtual networking and VDI, Getac rugged PCs and servers, a rugged medical tablet, medical carts, and rugged cabinets. In today's blog, I'd like to shine the spotlight on two specific solutions, Cirrus DT WiFi from NCS and Getac's RX10H fully rugged healthcare tablet. Cirrus DT WiFi is revolutionizing the virtual desktop experience in healthcare environments. The portable Cirrus DT WiFi is delivering a secure, uncompromised PC user experience in many locations in hospitals where desktop computing is difficult to implement, such as corridors and bedsides. Healthcare customers are raving about its unparalleled manageability, security, cost effectiveness. In healthcare, the Cirrus DT WiFi shines when paired with hospital medical carts. Typically, older generations of portable virtual desktops can be difficult and complex to administer, especially when they are tied to bridges for networking. The next generation Cirrus DT WiFi directly addresses these deficiencies. DT WiFi is easy to manage, roams effortlessly through corridors and uses three dipole antennas for superior reception. Cirrus DT WiFi is a proven hit in healthcare when coupled with Workstation on Wheels. With exceptional network capabilities in aisles, down long corridors and in patient rooms, Cirrus DT WiFi is the virtual desktop of choice for medical cart connectivity and patient care productivity. NCS partners with Ergotron StyleView to deliver a networking solution that is designed for enhancing workflow and superior caregiving. NCS and Ergotron deliver superior patient personalization, with data manageability, mobility and security. DHITS visitors were very impressed with the Getac RX10H rugged medical tablet. The tablet delivers on every critical factor: from its antimicrobial surface and comfortable design to the 10.1" LumiBond display and built-in array of security and data tools. The RX10H's thin, ergonomic design and no-slip grip make it comforable to carry through an entire work shift. Together with the NCS portfolio of servers and zero client laptops, NCS easily has one of the most impressive healthcare offers at the show. To learn about any of our solutions, please go to http://www.ncst.com/products. To specifically learn more about NCS zero clients solutions, just download our brochure.